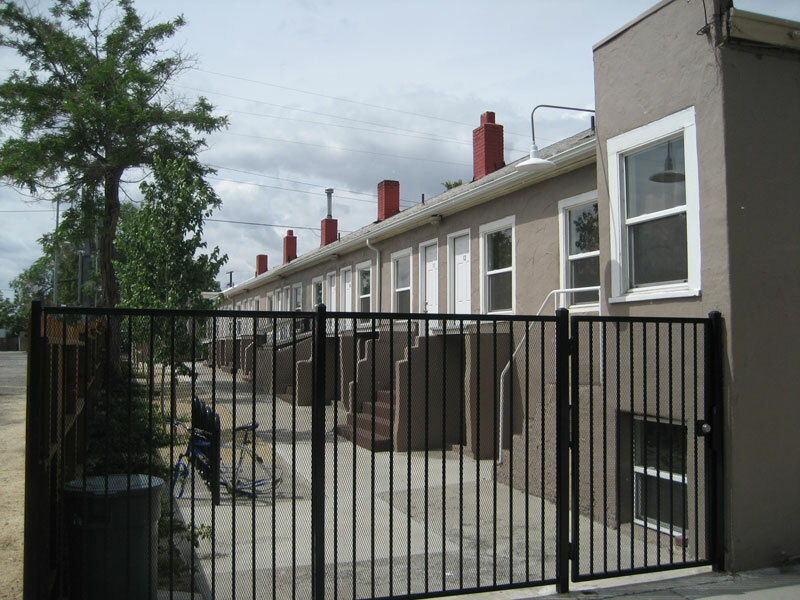 Affordable Living Near UNR. Offering 3, 6 or 9 month leases. Located on the Truckee River and less than one mile from the University of Nevada, Reno (UNR Campus) the River House offers a unique ‘off campus, near campus’ experience for students attending UNR or TMCC. Save money now and live comfortably in one of the three different studio styles and when the time is right you can upgrade to another one of our properties. 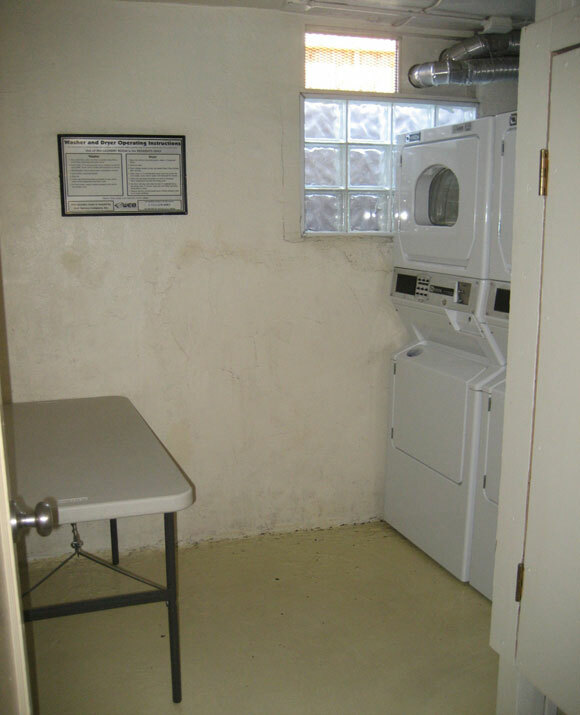 Each unit includes all utilities and WiFi for a $25 utility fee monthly. We encourage a quiet, nonsmoking atmosphere. Laundry is on site and the gated keyed entry provides easy access through the small courtyard to the building from our parking area. Bus, bike or drive to class. We have three month leases available and will extend that to a monthly lease based on your needs. 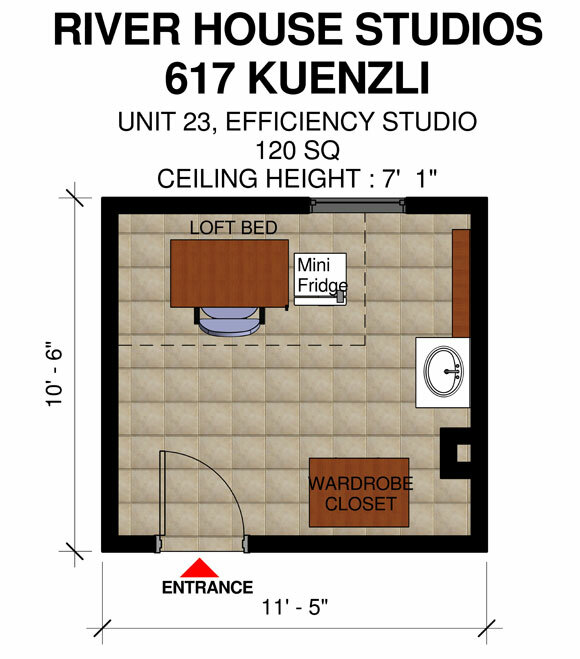 The Efficiency Studio is a private single occupancy unit that is approximately 120 square feet. This unit will meet your simple needs of rest and study. With private keyed entry you can choose to use our furnishings or bring your own. 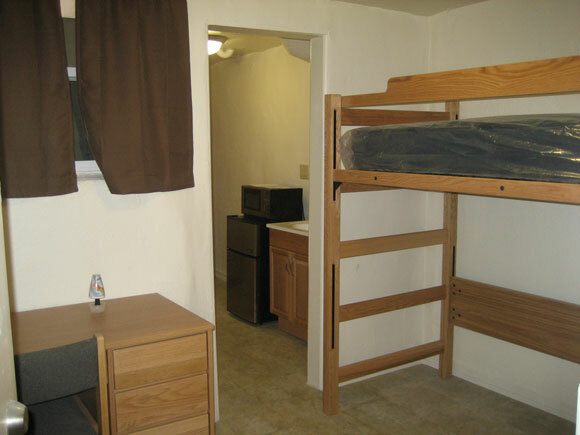 Our furnishings include a bed-frame with mattress, a desk with chair, a wardrobe closet and a combination microwave/fridge. 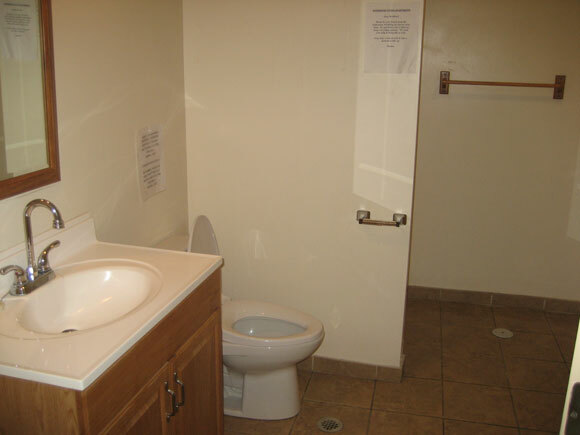 The bathroom and shower are shared with access 24/7. The Economy Studio is similar to our Efficiency Studio with some additional space. At approximately 180 square feet you will find just enough room to store your bike or snowboard. A perfect size for a Student on a budget. The Courtyard Studio includes it’s own private bathroom and shower, small kitchen entry and a sleeping/living room with easy outdoor access from your front door directly into the gated courtyard area. Furnished with a bedframe, mattress, a desk and chair, small book case and a chest of drawers you can choose to use ours or yours. 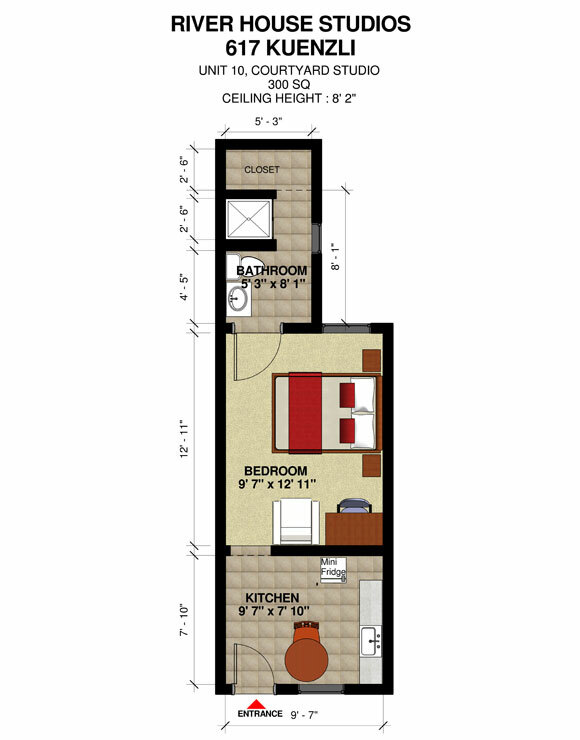 At approximately 300 square feet this unit brings a feeling of space and privacy at a conservative cost. 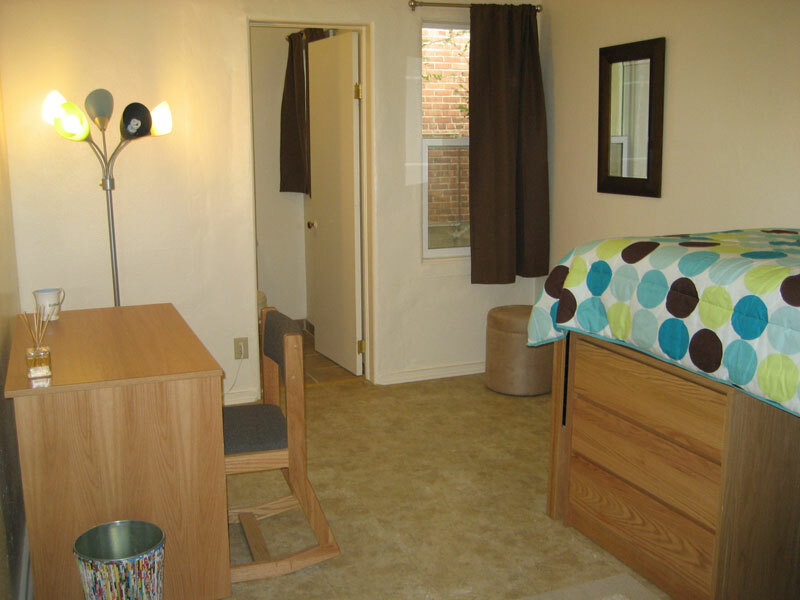 Easy application, no credit checks and each unit requires a $250 refundable security deposit. Certain rules to the building do apply. Although there are no stoves or ovens on site most residents are content with using the microwave provided in each unit or by purchasing a dual ceramic hotplate from Walmart. Cable is not included in utilities.